Looking for the best place to grab some breakfast food on campus? Look no further. Obviously, the amazing food. 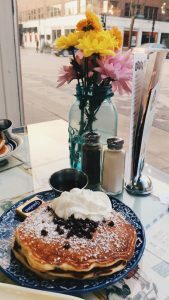 I’ve had my fair share of chocolate chip pancakes, but none of them are quite as good as Short Stack’s. They have just the right amount of chocolate chips and every bite is delicious. Their menu has a wide variety of both sweet and savory options, and no one I know has ever been disappointed with their order. The fresh and local ingredients. On Short Stack’s website, they have a section dedicated to displaying the brands they work with, which are all from Wisconsin. They also work with non-profit organizations and small businesses in the Madison area to give back to the community. Some brands they work with include Stella’s Bakery, New Glarus Brewing Company, and Sassy Cow Creamery. The cute decorations and inviting atmosphere. One of my favorite things about Short Stack is their tables. They have glass tops, and underneath them there are newspapers, letters, ticket stubs, and other small mementos from people all around the world. Exploring what’s on your table is a great way to pass the time while waiting for your food.